This section demonstrates the effect of the Brain Evolution System on a first-time listener, using EEG snapshots of brainwave activity. As we've said before, the brain does not operate at one brainwave frequency at any given time. By using an EEG unit to detect the minute electrical signals the brain generates, we can witness the effect of an environment or stimulus on the brain itself. This brainwave sample was taken right after the subject's brain was exposed to high pressure problem solving. During this test the subject was visibly agitated and inefficient. 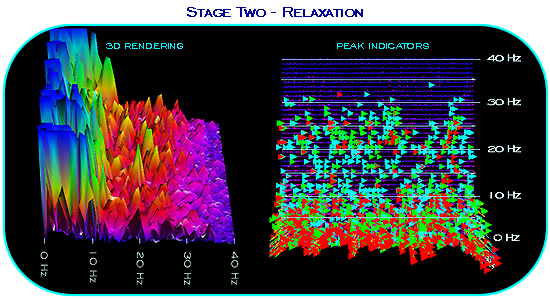 Notice the high peaks (amplitude) of the brainwaves, in the 3D rendering above left. Also, take notice of the accompanying high BETA brainwaves in the overhead peak indicator view, above right. This next image shows the same individual experiencing the first 5 minutes of BrainEv usage. Notice the significant decrease of amplitude in the brainwaves. During this period, the user reported feelings of refreshment and focus. A mere 12 minutes into the program and the listener descends toward low Alpha and Theta frequencies. During this period the user reported feelings of deep tranquillity and full body relaxation. The next EEG reading shows brainwaves 15 minutes into the program. You can see significant evidence of brainwave entrainment, as the brainwaves reach a consistent average of low Alpha and Theta frequencies. As the session completed, the listener reported a state of "absolute peace," which accompanied a profound connection to visual information and ideas. 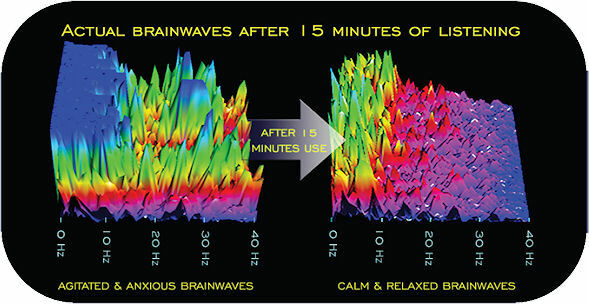 Compare these brainwave to the agitated and violent EEG patterns from the beginning brainwave sample and the results are dramatic - all within just 15 minutes. If such profound results are possible after the first 15 minutes of use, think of what you'll experience throughout the entire brainwave entrainment course! BrainEv.com Site Homepage | Research & Benefits | Free Demo | Enroll Now! Copyright © 2006-2019 Inspire3 Ltd. All rights reserved. 1. Any e-mail you give us is safe. We store your data in databases that only the staff of Inspire3 Ltd. (the company behind Brain Evolution System) have access to. No-one besides us will ever get your e-mail address. 2. We'll never sell you. We never rent out or sell our in-house contact lists like other companies might. So you'll never receive junk mail or anything from any third-party by entering your details into any of our forms. 3. Easy "one-click" unsubscription in every email. If you want to get off our list permanently, there's an "unsubscribe" link in every one of our outgoing e-mails. Just click it and you're instantly off the list... that means you'll never receive another e-mail from us (unless you specifically ask to, of course). I personally guarantee all of the above!